I realized last week, as I was tearing my trunk apart looking for furacin to sweat a leg, that I had completely lost control of my horse medical supplies. I used to have everything relegated to a small rubbermaid, but at some point I outgrew that and then just stopped putting things back after I used them, so all my supplies ended up separated, spread out, and lost. I couldn’t even find my damn thermometer last time I need it, and ended up having to scrounge through the barn’s med cabinet. That’s the ultimate in pathetic. So I’ve started pulling everything back together, taking inventory of what I still have, and jotting down things that I know are missing or have been depleted. I figured I’d wait and buy a container for all this stuff after I’m done assembling it, so I know what size I need. But so far I’ve been pulling all kinds of stuff out of the far reaches of my trunk… dmso, furazone, corona, ace, banamine, bute, dex, animalintex, vet wrap galore, etc. So disorganized. I’m still figuring out what all I’m missing though, and keep paging through Riding Warehouse veterinary/health care section to try to fill in some of the gaps. They do offer a handy-dandy first aid kit that’s already put together and packed with lots of the most crucial stuff… there’s a basic one and a vamped up trailering one. Pretty tempted to get one of those as well, to keep with my small “trailer trunk”, because I’m nothing if not paranoid, and that seems much easier than schlepping the entire med kit around when we’re hauling. But I also need to complete my full med kid for the barn, and I’ve got a good portion of what I need already. How I lost my thermometer, stethoscope, and twitch somewhere over the past few years is a mystery, but they are definitely MIA. There’s probably more, too, but I can’t think of it off the top of my head right now. So, what do you guys have in your med kit? Do you keep a separate first aid kit in your trailering supplies? exercise and am dreading it. My stuff is all scattered between my trailer, the barn, my truck, and my house. I think I have most of the items just a question of where it all is. I keep my refrigerated items in the barn fridge but everything else is usually in a Rubbermaid if I don’t think it’ll cook in the trailer. I definitely need a new thermometer as we had the sick baby this past spring and i know mine got contaminated and not returned. Mine’s become chaos as well. I have one tack box dedicated to such things, but it’s gotten pretty disorganized. I usually pack the necessities into a bucket with a lid for trailer trips, but I also have been wanting to have a keep in the trailer version. I think once my new trailer arrives, I’ll make that a priority. Might as well start on the right foot! I’m obsessed with med kit-ing. I have two tubs: a large one with vetwrap, roll cotton, poultice pads etc (large ‘cheap’ stuff) and a smaller one that stays hidden that has my precious items like dorm, dermalone, syringes etc. I have a headlamp in my braiding kit, but it occurred to me that it would probably be smart to put one in the med kit too! I have this. It was the best Christmas present ever! This is what we use for our pony club team kits for competitions. They’re fantastic. And bottom holds tall bottles upright and wraps. I have a smaller version from this same series that unsnaps to 3 sections in my trailer for a “mini” kit which focuses just on emergencies till a vet would be called. Love it. 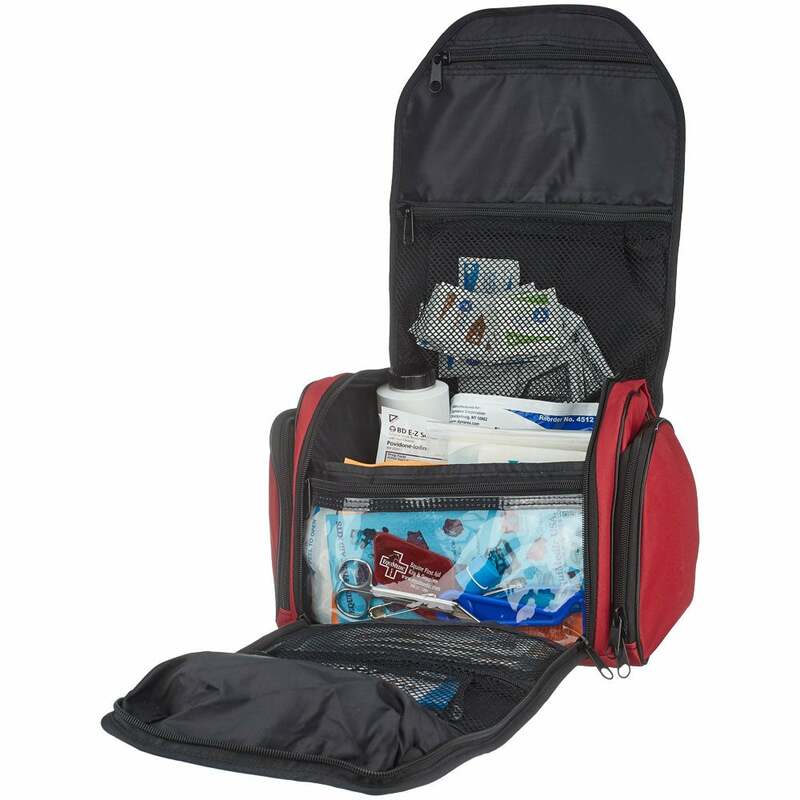 I’m definitely going to buy a already put together med bag for my trailer when I get one… one for me and the horse 😂 My barn kit is definitely lacking… I think I’m down to poultice and paper… and that’s about it. I have most of what I would like to have a for a med kit, but I don’t have banamine or bute. I don’t know how to do IV injections, so will likely ask for some bute and banamine paste next time I am at the vet. I have a smaller clear plastic tote with a handle that I take with me when I trailer. Other wise I’ve got a 5 gallon bucket plus the clear container at the barn. Since my horse and pony are at my father in law’s, I typically keep all of my med stuff in the house so it isn’t affected by extreme heat or cold. I would suggest nitrile or some other non-latex version for the gloves. That way if you need assistance you don’t have to worry about someone else potentially not being able to due to a latex allergy. I have pretty much everything I need – I do need a bigger tote tho because I have TOO MUCH STUFF. It’s a good reminder tho – I need to get more telfa non-stick pads, witch hazel, and betadine. This reminds me that I keep forgetting to get hoof testers and nippers. Man, I feel like a bad horse mom now. My med kit is down to wraps and that is about it. We used to keep banamine and bute around, but it kept expiring before we used it and I hate throwing money away. Part of the problem is that the hubby is a vet and owns his own practice, so when we have needed things he just runs and goes to get it. It isn’t the best plan in a dire emergency though. I have smaller, travel size first aid kid (for humans and horses) in my trailer. Vetwrap, duct tape, wraps, bandaids, banamine, bute, triple antibiotic, gauze, etc. I’m sure there’s more. The human version came from Target and has come in handy several times! If nothing else, I feel better knowing these items are in the tack room of my trailer – just in case! This is a great yearly (at least) project to take stock of what you have. I wrote about my first aid kit a while back. I definitely keep a barn kit and a separate trailer kit. It is so much easier that way. I’m revamping mine this year. It was mainly for bandaging so the basics plus stethoscope, thermometer… But now going to add the “RX stuff” from the vet if I can get it. Most of my stuff I found expired or froze – oops. Betadine and Sudocrem is my staples. I really need to get a container to house all my medical supplies for when I go to shows, otherwise I have my own, private barn at home so everything lives on a shelf in my tack room (or if I am worried about temperature stability for the bute, banamine, dex, etc, they live in my house). I also use wipes (baby wipes + anti-bacterial hand wipes) a TON; to wipe off the thermometer, to wipe goops and gunks off my hands after applying, on the horse, etc. Definitely recommend a pack of those in a medical kit as well! In the tack room I use a stacking drawer system. 2 bottom drawers are deep for taller bottles, leg wrapping materials, etc. Smaller top drawer is injectables, thermometer, syringes, , any other smaller items. Works perfect for me! Small tote separate for trailering, as most of the larger items (non perishables ) already have a home in the trailer cupboard, leaving me to only have to take smalle, rarely used and heat sensitive items. I bought farrier tools after my horse partially sprung a shoe, stepped on the clip, and then I couldn’t get it off. That only has to happen once lol. Yeah, when I read your list that was the immediate scenario that popped in my head.